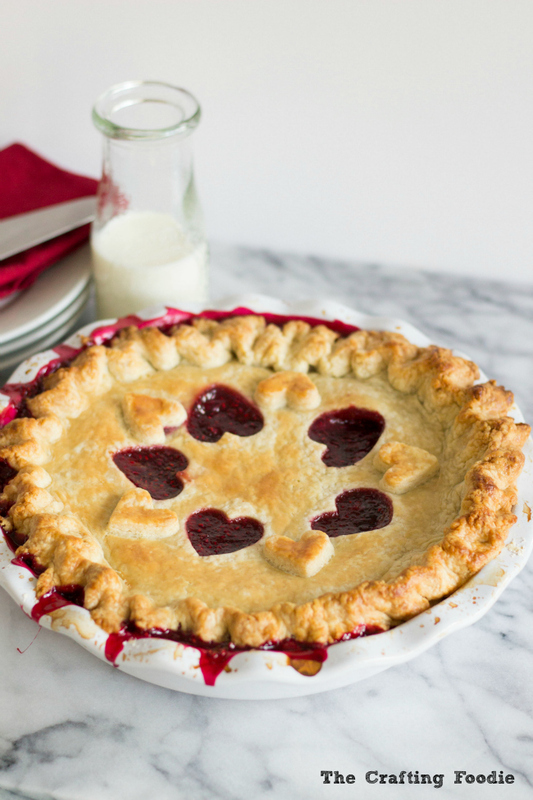 When I first baked this strawberry pie, my kids went nuts. They LOVED it. I mean, they loved it so much that I’ve baked it almost a dozen times since. I even went so far as to freeze rhubarb so that I could continue to bake that pie even as summer transitioned to autumn. And my kids are critical little eaters. Sugar and sprinkles aren’t enough for them. I can’t tell you how many times they’ve taken a bite of a slice of cake or cookie, only to reject it. The most commons causes of rejection are it’s: too crisp, too soft, too moist, not moist enough, and my all-time favorite reason, “I just don’t like it.” Haha!! We have very close friends who suffer from nut and egg allergies. And whenever we have dinner with them, I love making pies. The nut-free options or limitless, and pies are egg-free. I simply substitute whole milk for an egg wash to get a golden top crust. So when I decided to make a pie, naturally the kids asked for the same strawberry one. But, I had 2 bags of beautiful raspberries that we picked this summer that were frozen. So, I decided on a Raspberry Pie. 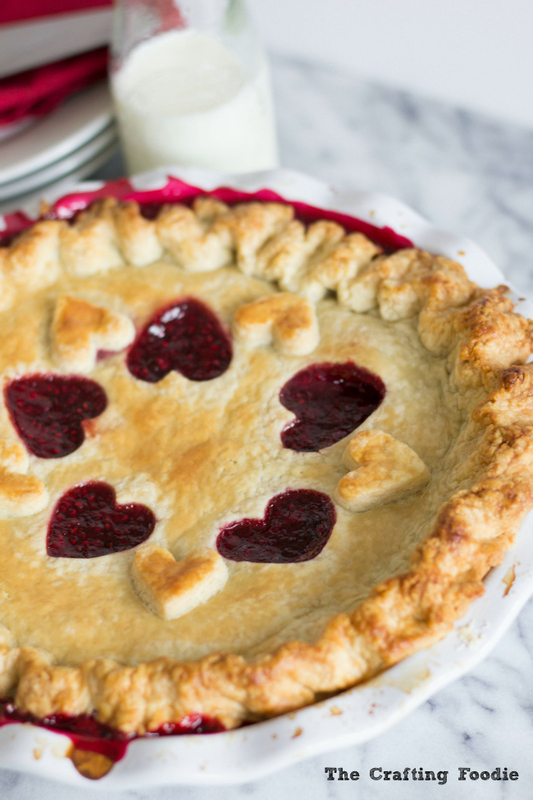 I’ve made Raspberry Pie before, but this time I incorporated some hearts to showcase the beautiful, deep pink filling in an attempt to lure my girls into liking it. Needless to say, the hearts did indeed lured my girls into trying the pie. My older daughter loved the crust (as usual), but rejected the filling as being too tart. And my younger one LOVED the hearts, but rejected the filling because of the seeds. 🙁 But my husbands and friends devoured the pie. All that was left was one small wedge. I enjoyed the not-too sweet filling in this Raspberry Pie. It’s tart, and it allows the flavor of the raspberries to shine. The filling also pairs so perfectly with that golden, flaky, buttery, and rich crust. And the heart shaped vents in the crust give that Valentine’s Day touch. 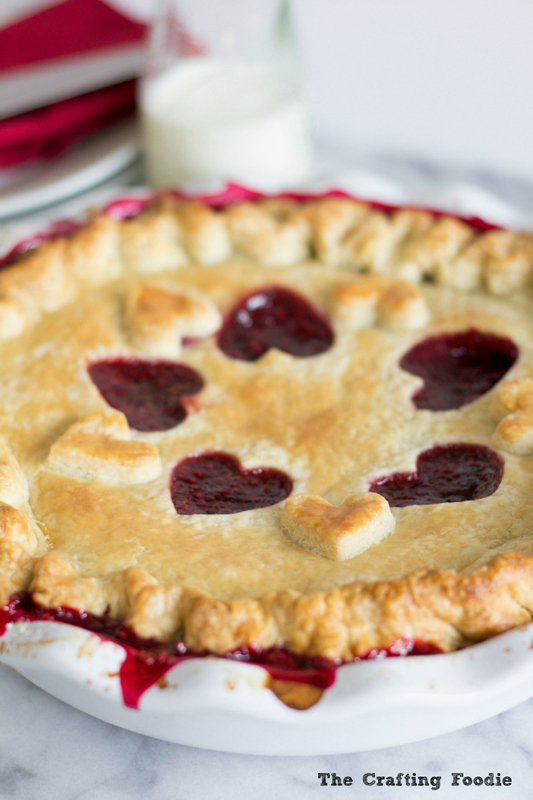 This Raspberry Pie is made with an all-butter flaky crust filled with a fresh, tart raspberry filling. 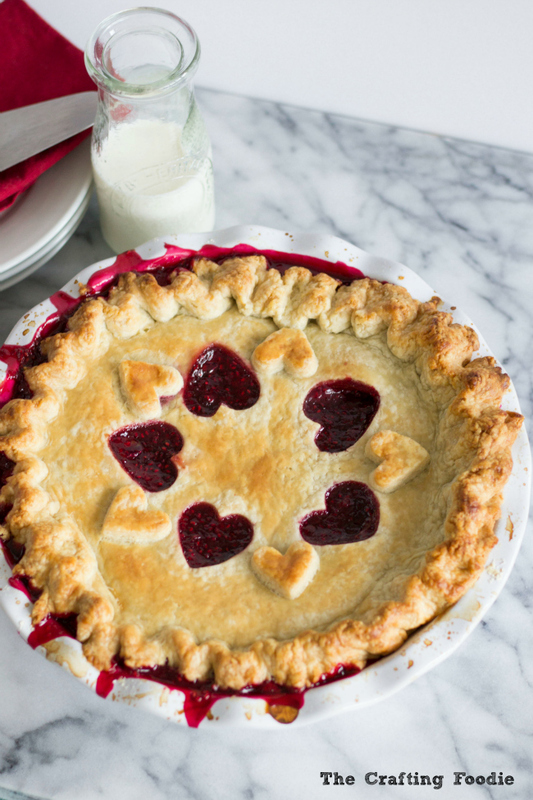 With the heart cut-outs venting the pie, and a gorgeous, deep pink filling, this Raspberry Pie is fitting for any Valentine's Day celebration. In a medium bowl combine the flour, salt, and sugar. Mix until combined. Add the butter, and using your fingers or a pastry cutter, rub the butter into the flour mixture until pea-sized pieces of butter remain. Add the water a few tablespoons at a time and mix. Continue adding water until the dough forms a ball. Flatten each piece into a 4-inch disk. Wrap in plastic wrap and chill for at least 30 minutes. Place a rack on the bottom level of your oven. Place a baking sheet in the oven and heat the oven to 500 degrees F.
Remove the pie pastry from fridge, and allow it to sit at room temperature for about 10 min. Mix the fruit, sugar, lemon juice and zest, and tapioca. Let stand for about 15 minutes. On a lightly floured surface, roll one pastry disk to fit a 9-inch pie plate. Fit the pastry into the pie plate, leaving a bit of overhang. The overhang will be used to crimp the sides edges of the pie. Place the pie filling into the lined pie plate. Chill in the fridge while rolling out the other pastry disk. On a lightly floured surface, roll out the second pastry disk. 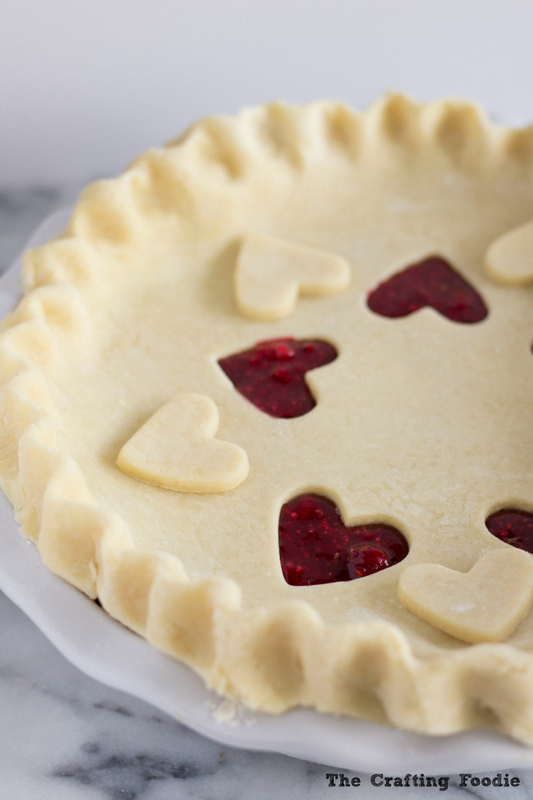 Using a mini-heart cutter, cut out hearts to vent the pie. Remove the pie from the fridge and place pieces of butter on top of the pie filling. Place the rolled out pastry on top of the filling. Crimp the edges of the pie to seal the bottom and top pastry. Using a pastry brush, brush the top of the pie with the milk. Place the pie on the pre-heated baking sheet. Lower the oven to 425 degrees F.
Reduce the oven temperature to 375 degrees F. Continue baking for 30 to 35 minutes until the juices bubble and the crust is golden brown. Transfer the pie to a wire rack to cool to room temperature for about 1 to 2 hours until the juices thicken. *At this point the edges of the crust may be getting browner much faster than the center of the pie. If that is the case, make a foil sleeve to cover the edges of the pie. Once the edges are covered, continue baking until the rest of the pie is thoroughly browned. Thanks so much! The last time I made raspberry pie was before my youngest was born (that’s 3 years ago!). It’s such a delicious fruit that works so well in pies and pastries. I hope you give it a go – it’s so simple and delicious! This looks so beautiful! I have never made raspberry pie but I want to now! Thanks Chris! Raspberry pies aren’t that common, but they are delicious. I’m a huge fan of raspberry filled pastries, and raspberry pies fall along the same lines – delicious pastry with a tart, fresh filling. So good! How lucky are your kids? I actually prefer raspberry pie over strawberry so this is perfect for me and maybe I’d share with my kids…hee…hee. Thanks Claudya! My kids think that homemade sweets are so boring. When we go to the grocery store they always ask to buy the packaged cookies. Haha! But we stick to homemade around our house. I figure one day they’ll realized how unique that is 🙂 I love raspberries too! 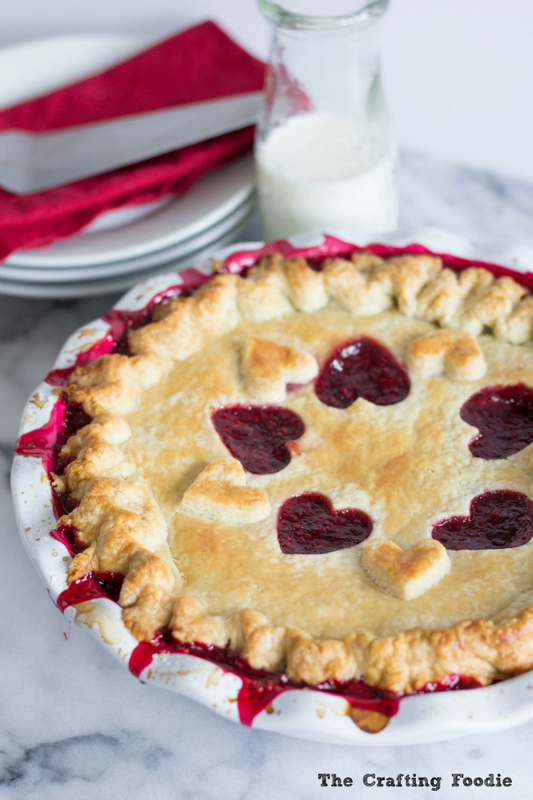 I love raspberries and this is such a gorgeous pie! Adding it to the list. Thanks so much Colleen! American pies are so easy to make, and you can fill them with anything 🙂 I hope you give it a try. I also love the heart cut-outs! This looks just absolutely delicious! I will have to try it. I really love the hearts. Thanks so much Bella! 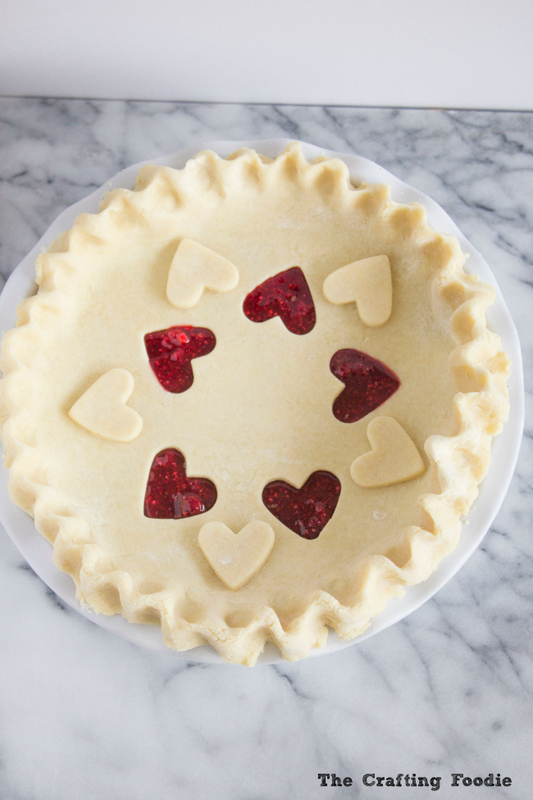 The hearts make it so much fun – and you can customize it for whatever occasion. I’ve cut out “Happy Birthday” on a number of pies. They make excellent birthday cake substitutes! You pie is so beautiful! Thank you for sharing this recipe, I am going to try this. I have a row of 25 raspberry plant and usually we use the berries for our morning smoothie but, I think I’m going to have to reserve some of the raspberries for this pie. Thank you! I love this and its perfect for Valentines day. The crust is just so cute!! I have always wanted to try making a pie from scratch! This looks delicious and AMAZING! Love the hearts! What a gorgeous pie! I love that you used raspberries. Strawberries get so much of the glory in pies but my kids and I love picking fresh raspberries and freezing batches to use during the winter. Adding this to my yummly collection to make this! Okay, this pie is just gorgeous!! I have actually never tried a raspberry pie, but would love to try one! This pie is gorgeous! And I’m sure it’s delicious as well. Such a pretty idea for Valentine’s Day this weekend.